1, 1, 2, 3, 5, 8, 13, 21, 34. . . Look carefully. Do you see the pattern? Each number above is the sum of the two numbers before it. Though most of us are unfamiliar with it, this numerical series, called the Fibonacci sequence, is part of a code that can be found everywhere in nature. Count the petals on a flower or the peas in a peapod. The numbers are all part of the Fibonacci sequence. In Wild Fibonacci, readers will discover this mysterious code in a special shape called an equiangular spiral. Why so special? It mysteriously appears in the natural world: a sundial shell curves to fit the spiral. So does a parrot's beak. . . a hawk's talon. . . a ram's horn. . . even our own human teeth! 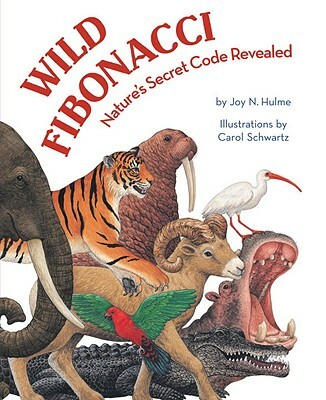 Joy Hulme provides a clear and accessible introduction to the Fibonacci sequence and its presence in the animal world. JOY N.HULME has 1 + 2 = 3, 2 + 3 = 5, 3 + 5 = 8, 5 + 8 = 13 children, grand-children, and great-grandchildren. For years, teachers everywhere have praised her math books. Joy lives in Monte Sereno, California. CAROL SCHWARTZ has received many honors for her illustrations. She lives in Cincinnati, Ohio, with her husband and two children.